Shadow Magic is the first of the Lyra books by Patricia C. Wrede, one of my auto-buy authors. Wrede wrote Dealing with Dragons, Snow White and Rose Red, and the Mairelon the Magician books (all of which are on my favorites shelf). 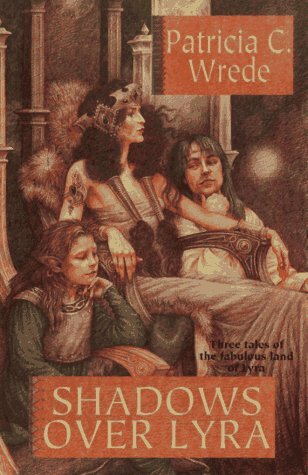 I originally read Shadow Magic as part of the Shadows Over Lyra omnibus edition, which contained the first three books in the Lyra series. In Alkyra, children's tales are told of a time long past when humankind shared the land with folk who had magic in their blood and bones: the small, fierce Wyrd of the forests; the proud Shee in their mountains citadel carved of ice-white rock; and the shimmering Neira of the dark sea. As a child, Alethia had shivered in delicious fright when the bards sang the lays of Alkyra's mythical past. But as a grown woman her nightmares come from the world of human reality: the spreading discontent in a land ruled by querulous noble families, and the soft rumors of war. As a daughter of one of Alkyra's leading families, she has no time now for children's tales. Until she learns that they are all true. Alethia is a rather headstrong young noblewoman, unaware of much of the world beyond her father’s holdings in a peaceful city-state in Alkyra. That changes when a merchant’s guard accompanies her brother home from a trading trip and tells of disturbing disappearances among the caravans. These events, combined with rumors of an ancient and evil Shadow awakening across the mountains, form the backdrop for an adventure that will change Alethia and her land in ways she cannot imagine. I remember going through Wrede’s backlist and positively devouring everything I found there. I LOVED the Lyra series as a teen, and I hadn’t reread Shadow Magic until this summer, after I found that my library had an ebook copy available for download. Unfortunately, I was not as enchanted with the book upon rediscovery as I was all those years ago. BUT. Shadow Magic still has many merits, one being a fast-moving plot, which contributed to my spending much too late a night finishing the story. Another strong point of Shadow Magic is the world building. World building is a Wrede specialty, and there is never any doubt in her books that the place is solid, realized, and that magic is a possibility. While Alkyra is a traditional fantasy setting (swords, sorcery, dangerous forests, a la Tolkien), the execution is spot-on and the result interesting. What lead to my rereading disappointment, then? I don’t fault the book, I blame myself. Since that first time I read Shadow Magic, I’ve read a LOT of fantasy, over many years. I’ve read Robin McKinley, Diana Wynne Jones, Neil Gaiman, Garth Nix, Patricia McKillip, Ursula K. LeGuin, Charles de Lint, and on the list goes. I picked up Shadow Magic again and found that it was too similar to other books to stand out as amazing. It contains what I recognize now as fantasy clichés. Its ending is incredibly similar to that in The Blue Sword (a favorite of favorites). I do not find Shadow Magic less worthy, I find it less original. And while that is disappointing, it’s not world-ending. I still plan to pick up the next few titles in the Lyra series, because they are, after all, Wrede books. Recommended for: fans of traditional high fantasy (with the expected knife fights, feats of archery, and mysterious magic), and anyone who has read Patricia C. Wrede and wondered where she ‘started’ in writing. I haven't read much Patricia Wrede--I somehow missed her when I was young. Someday I might remedy that, just as soon as I catch up on my tbr piles...This one sounds not unappealing.